They reached this conclusion after studying the latest observations from NASA's Curiosity rover, which just analyzed the first-ever sample collected from the interior of a Red Planet rock. Here are answers to a few basic questions about Curiosity's discovery, and what it means about the Red Planet's past and the rover's future. What exactly did Curiosity find? The rover's onboard Chemistry & Mineralogy (CheMin) and Sample Analysis at Mars (SAM) instruments found some of the chemical ingredients for life in the collected powder, including sulfur, nitrogen, hydrogen, oxygen, phosphorus and carbon. The mix of compounds also suggests that the area may have contained chemical energy sources for potential Red Planet microbes, researchers said. In addition, the sample contains clay minerals, indicating that the rock was exposed to a benign aqueous environment — such as a neutral-pH lake, for example — billions of years ago. To be clear, Curiosity found no evidence that life has ever existed on the Red Planet. But its results suggest that the John Klein site could have supported microbes long ago, if they ever evolved on Mars or were transported there. So what? Didn't we already know that ancient Mars was wet? Scientists have known for years that water flowed or pooled on the surface of Mars in the ancient past. But there's more to habitability than the mere existence of liquid water. For primitive microbial life to survive, a site must also have the right chemical makeup and a potential energy source, researchers say. And all of these ingredients were apparently present at John Klein. Doesn't the right chemical makeup include organic compounds? Did Curiosity find any of those? The SAM instrument can detect complex organics — the carbon-containing building blocks of life as we know it — and Curiosity is looking for these molecules on Mars, but it hasn't found anything conclusive yet. The rover did detect two simple chlorinated organics at John Klein, as it did in a scoop of soil at another site called Rocknest late last year. There's no sign of complicated, long-chain organics such as amino acids yet, however. But such molecules are not necessary for life to thrive, Curiosity scientists said. Here on Earth, many microbes do just fine by incorporating inorganic carbon — such as that contained in carbon dioxide — into their metabolic processes. And SAM did detect carbon dioxide in the John Klein sample. "That's what we're real excited about," Curiosity chief scientist John Grotzinger, of Caltech in Pasadena, told reporters Tuesday. 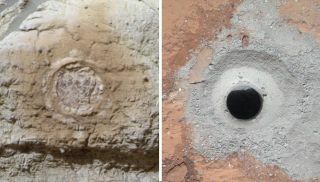 This set of images compares rocks seen by NASA's Opportunity rover and Curiosity rover at two different parts of Mars. On the left is " Wopmay" rock, in Endurance Crater, Meridiani Planum, as studied by the Opportunity rover. On the right are the rocks of the "Sheepbed" unit in Yellowknife Bay, in Gale Crater, as seen by Curiosity. Image released March 12, 2013. How sure is the Curiosity team about all of this? Pretty sure. Scientists typically are careful people loath to go out on a limb about their findings (with good reason, as their colleagues will quickly snap that limb in two if it's not sturdy enough). But there was no hemming and hawing about John Klein's long-ago habitability. "We have found a habitable environment that is so benign and supportive of life that probably — if this water was around and you had been on the planet, you would have been able to drink it," Grotzinger said. Does this mean life could survive on Mars today? Curiosity's new results don't really speak to this issue, instead shedding light on Mars as it existed three billion years ago or so. The Red Planet is much drier and colder today, making it considerably less hospitable to life as we know it. However, some researchers think Mars may still be capable of supporting microbial life, perhaps in damp, protected pockets underground. Is Curiosity's mission over now? Hasn't it done what it set out to do? Curiosity's main goal was to determine if the area around its landing site — Mars' huge Gale Crater — has ever been capable of supporting microbial life. And the 1-ton rover has indeed checked that box, just seven months after touching down. However, the Curiosity team has no plans to quit now. They want to keep searching for signs of complex organics and investigate other sites, to gain a better understanding of how the Gale Crater area has changed over time. The John Klein site is not even the rover's final destination; at some point, Curiosity will turn its wheels toward interesting deposits at the base of Mount Sharp, the mysterious 3-mile-high (5 kilometers) mountain that rises from Gale Crater's center. Scientists continue to stress that Curiosity's mission is discovery-driven, meaning they'll shape their plans around whatever the robot finds as it rolls across the Martian surface.